The combination of battery and charger works like a committed relationship; they simply can’t live without each other for long. You need to make the right choice for your charger so that these batteries stay for long with you. Making the right choice and doing some homework on on-board marine battery charger will remove all the confusion running in your mind. There are two types of chargers – On-board and Portable. Onboard chargers are more expensive than portable chargers, but they are worth the deal due to various reasons. The whole system of the on-board charger is wired and connected so that it permanently gives you its services and prevents the risk of being stolen. Most on board marine battery chargers work on a 120-volt outlet. Onboard chargers are sounder technologically. These come with advanced features with advanced units that give you the liberty of multi-stage switching and charging different batteries on the boat. Some companies have now released waterproof battery chargers to give you extra safety. A good battery charger for boat helps the marine engine to run efficiently, gives immense power support, and can manage automotive as well as deep-cycle batteries. Before you decide to pick a branded and reputed onboard charger, its important for you to know that it charges twice as much as any other chargers. Some onboard chargers also help you to repair damaged batteries and aids in tracking the operations timely. The chargers are built of spark proof mechanism, reverse polarity feature, and overcharge preservation option. 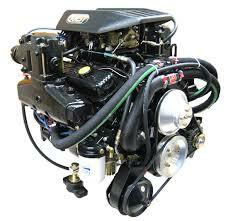 It is one of these reasons why most boaters prefer to go for an onboard marine battery charger. Before you choose an onboard charger for your boat, check the number of accessories that you are planning to carry. 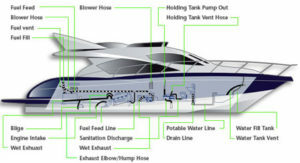 Perhaps, the more accessories in your boat need a more efficient on board charger. From cranking motors to deep-cycle motors, onboard battery chargers have room for everything. It is difficult to comment which charger is the best as these vary as per the needs of the journey. Companies like Amazon have few recommendations for you. 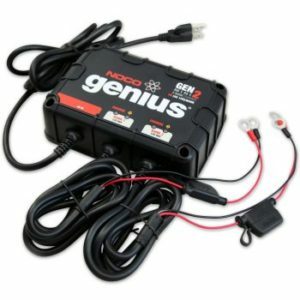 NOCO Genius G4 6V/12V and MinnKota MK 330D are the two most recommended onboard marine battery chargers for a boater. Check their specifications and manual before you choose the charger as it must match your requirements of the journey.